During my 20-day Balkan road trip with Milena, one of the countries that was on my bucket list was Slovenia. We didn’t know exactly what places we were going to visit in Slovenia. What we did know was that we had to go on the Postojna Cave Tour. I’ve read lots of articles about the deep and mysterious Postojna Jama in Slovenia. I’ve also seen lots of photos and was dying to explore this attraction. I must say, months after coming back home, I still sometimes remember how exhilarating the whole experience was. The tour felt like leaving reality and entering a new dimension. Postojna Cave (Postojna Jama) is located near Postojna, Slovenia. It is 48 kilometers away from Ljubljana, the Capital of Slovenia. The famous Diamond and Cathedral stalagmites you will get to see on your tour. Postojna Jama Slovenia is a top tourist and geological attraction, created by the Pivka River. Postojna is the second-longest cave in Slovenia with length of 24,120 meters and depth of 115 meters. Visitors can book a Postojna Cave Tour to explore a large part of this magnificent gem of nature. It was supposedly first explored and described by Hohann Weikhard von Valvasor in the 17th century. However, there are indications that the cave was used much earlier. And, it became widely recognized as a tourist attraction in 1819 when its was visited by Archduke Ferdinand. Now, going on a tour of the Postojna Cave is a dream of nature lovers worldwide. White Stalactites in Postojna Cave. Every tour has an allocated time slot. During that time slot, large groups of people enter – we had over 50 people in our group. Don’t panic, there is enough space for everyone; the train has over twenty carts. Regardless of the language tour you have chosen, everyone gets mixed together, since you will receive an audio device for the language you have chosen, except for the English tour, to listen into as you walk around the three different levels of the cave. As you enter, the main group will be split into multiple waiting lines based on the language tour chosen. Then the security officers for your line will check the tickets and let you in toward the main entrance. Be ready to smile because as soon as you enter, they take a picture of you (you can purchase at the end of the tour for €5). As you enter the cave, you will see the train that you will hop on – it’s like the ones for kids in amusement parks. The Postojna Cave tour duration is about an hour. For the next 60 minutes, you won’t be checking your Facebook status or uploading Instagram photos – you can’t even take a selfie on the train. You should be careful, well-clothed and attentive to your surroundings. The tour will take you through three-levels of the Postojna Cave, allowing you to see amazing stalagmites and stalactite formations. Check out our post about natural gems of the Balkans to discover similar must-visit destinations such as Cave Vrelo or Ohrid Lake. To have a great tour, I would like to provide my readers with several tips regarding the main points of interest. All these tips and details are based on my personal experience and apply to information at the time of my visit. The Postojna Cave tour pricevaries depending on the season (on and off-peak) prices. Plus, there are various packages that let you combine multiple attractions. For example, visiting only the Postojna Cave is cheaper than visiting both the cave and the Predjamski Castle – I highly recommend visiting the Predjamski Castle. Whatever package you decide to buy, I strongly advise you to purchase your Postojna Cave tickets online. This way you get to choose the starting time of your tour and avoid waiting in endless lines. For those that have online tickets, there is a separate section at the cashiers building to pick up the tickets. We made the mistake not to get online tickets and ended up waiting in-line for 2 hours just to buy tickets. Depending on the month of your visit, the tours start between 9 AM and 6 PM. The tour times at Predjamski Castle also depend on the season. They generally start at similar times with the Postojna Cave at 9 AM and end after the last tour at 6 PM. I advise you to check Postojna Cavetimetable of the park complexfor opening hours before booking any tickets. I believe it’s better to go early in order to have more time to enjoy everything the park offers. After all, there are coffee bars, restaurants and souvenir shops you don’t want to miss. During the summer, expect there to be substantial number of people. The busy hours of the Postojna Cave are between 10 AM – 3 PM. Of course, this is during the high season in the summer, so it doesn’t apply to the off-peak season. Starting point for the Postojna Cave tour. There are multiple large parking lots – for cars and motor homes. There is a one-time parking fee of €5 for the entire day. If you are guest of Hotel Jama, then parking is included free with your reservation. If you plan to visit the Predjamski Castle, don’t worry about your car. In the ticket package, a free bus ride is included from the Postojna Cave to the Predjamski Castle and back. The bus runs every hour in each direction and be aware that during the summer it does get crowded. That’s why I strongly suggest getting online tickets to book your Postojna cave tour as early as possible to avoid the crowds. The complex is also wheelchair accessible, even the parking lots have specifically designated parking areas. You can even get a 50% tour discount on tickets when presenting a mobility impairment certificate. Postojna Cave is located near the village Postojna. If you are looking where to stay near, you have several options when it comes to accommodation: guest houses, apartments, hotels, and even Airbnb. Postojna is a transit zone for those traveling between Italy and Budapest, so it’s a busy place. The village is very cute with the standard Slovenian wooden houses and flower decorations you will see throughout the countryside. The nature is magnificent. Get the latest prices on accommodation in Postojna here. 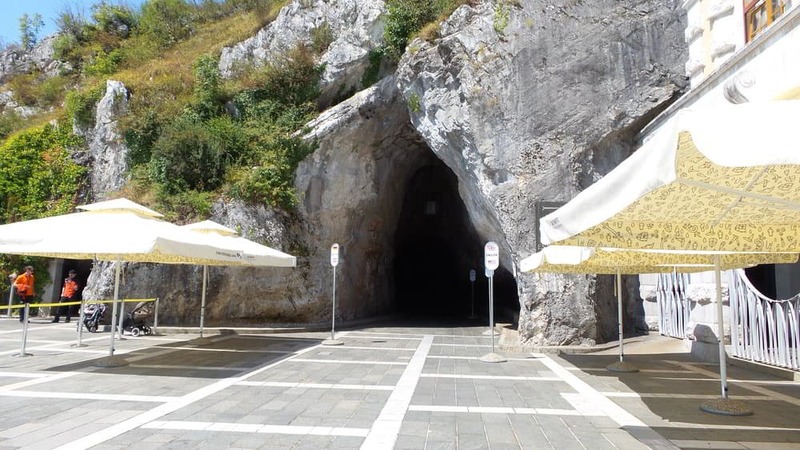 If you want to be right next to Postojna Cave, then consider booking a room with Hotel Jama, which is located right on the property of the Postojna Park. If you are new to Airbnb, you can get a $25-credit toward your next booking on us. Postojna Cave makes a great day trip from Ljubljana, Zagreb, Trieste, and even Venice. Most tourist visit with their own vehicles – cars or RVs. However, Postojna is conveniently located near Croatia, Italy, Hungary, and even travelers from Austria and Serbia can reach the park in few hours. Regardless, even if you don’t have your own car you can take public transportation, a bus or train, depending on your departing location to reach the cave. Restaurants and Cafes in the Postojna Park. There is a direct bus that goes from Ljubljana to Postojna that stops at the parking of the park complex. You can get the direct time table from the Ljubljana Bus Station (Avtobusna Postojna Ljubljana). Search for “Postojna Jama” as the arriving destination. Find buses from Trieste to Postojna. Find buses from Koper to Postojna. Be advised if the arrival station is “Postojna” that means the bus will stop in the village of Postojna not by the Postojna Adventure Park. You can walk to the park complex, which is about 25-minutes. 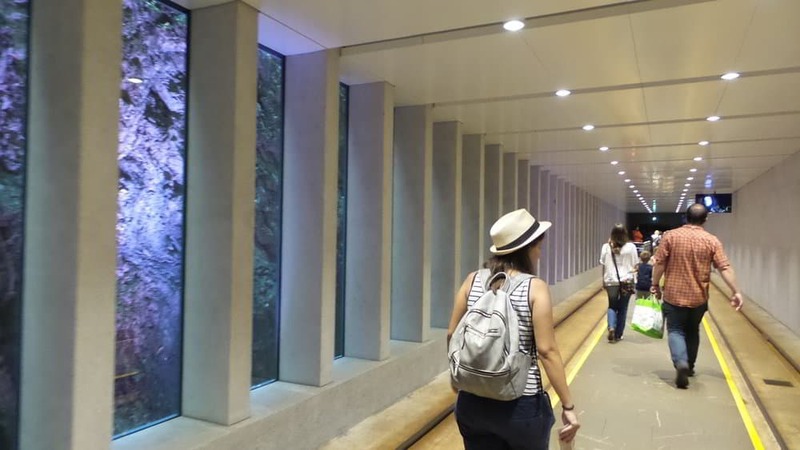 The train station in Postojna is located about a 30-minute walk from the Park. Trains from the bordering countries – Hungary, Austria, Croatia, and Italy – have daily time schedules that pass-through Postojna. This connects Postojna to Zagreb, Salzburg, Rijeka and Koper. The train ride in Postojna Jama. The most popular feature of any Postojna Cave tour is the famous train ride. To get to the starting point of the walking tour, you get to hop on a cute train and go for a train ride. It’s a pretty fast-moving train, and the ride is about 5-10 minutes. The train takes you deep inside the cave and you may find yourself keeping your head down as you move incredibly close to rock formations. When the walking tour is over, the train once again gives you a ride, but this time it takes you back to reality. The temperature goes between 8 °C and 10 °C. Moreover, the level of humidity in the Postojna Cave is always 95%. Therefore, it is highly recommended to wear warm clothes and waterproof shoes on your tour. In my experience, jeans and a sweater did the trick. The only time I felt cold was when the train was moving; otherwise, while walking around the cave I was comfortable in a sweatshirt. There were other people, however, that wore jackets and even hats. So, I guess everything depends on what type of person you are. The shops in the park sell jackets and sweaters, but these are overpriced. Right before getting on the train you can also rent a jacket, but this is expensive as well. Baby Dragon Souvenirs in the Postojna Jama Park. The human fish or olm, known as baby dragons in Postojna, is a cave-dwelling chordate species find in Europe. Visitors on the tour get a unique chance to see this threatened species. Remember to be a reasonable and good tourist and listen to the warnings of the tour guides. Namely, human fish is extremely sensitive to light and you mustn’t photograph it. The flash from cameras are not allowed near the tank of the Postonja human fish. At Postojna Adventure Park, you can find over 17 language audio tours besides the standard English tour guide. If you are Macedonian/Serbian and speak English, I highly advice to get the Serbian audio translation instead of taking the English tour. The English tour is the only one without audio devices and you will have to carefully listen to your guide tour. If you are one of the lasts one in the group, you might have a challenging time hearing your guide and miss important information. Pets are allowed in the Postojna Adventure Park, but not in any of the attractions including the cave. However, there are kennels that will take care of your dogs while you explore the park. The Predjamski Castle in Postojna, Slovenia. Underneath the Predjamski Castle, there is a cave. For those that love to visit it, make sure you get a ticket package including all three attractions – Postojna Jama, Predjamski Castle, and the Predjamski Castle Cave. Beware that the last tour of the Predjamski Castle Cave ends around 5 PM. So, you can only enter by 4 PM, since the tour lasts around 45 minutes. We ended up getting at the castle around 4, but were unaware of the last tour time, and missed our chance to see it. With everything said, I must say I loved adventure park in Slovenia. Even though a bit pricey, Postojna Cave is something anyone should experience. The cave itself is magnificent and when you add the Predjamski Castle you end up having an unforgettable day. Plus, it’s not every day that you get to see endemic species, ride inside a deep cave with a train, and enter a medieval castle within 5 hours. Therefore, I recommend everyone visiting Slovenia to sign up for the Postojna Cave Tour.